If you've been following my blog regularly you'll probably know that my husband is currently working in Saudi Arabia. As a result we try to meet up as often as possible, either somewhere else in the region or he'll come back to the UK for a few days. This time it was my turn to travel and I got to visit a country that since going has rapidly climbed into my list of favourites, Jordan. As is usual we only had a few days together so I only visited Petra (only she says) whilst there but with so many other places in the country worth visiting I really hope that at some stage I'll get to return to see more. But in the meantime what adjectives can I use to describe Petra other than it was absolutely amazing! I flew into the capital Amman late at night to meet up with my husband who'd arrived a few hours before me from Riyadh. We stayed there overnight before setting off early the next day on the approximate three hour drive to Petra. We booked a car and driver beforehand to take us there and for the return trip, it was lovely being taken door to door and just sitting back to enjoy the drive. As it was a three hour drive there was a good chance to see a little of the country going (it was dark on the way back), this part seemed predominantly flat, until we got closer to Petra, with a lot of open space and just a few villages/small towns on route. On the journey down we were also able to take a comfort break and enjoy our first Arabic coffee of the trip. 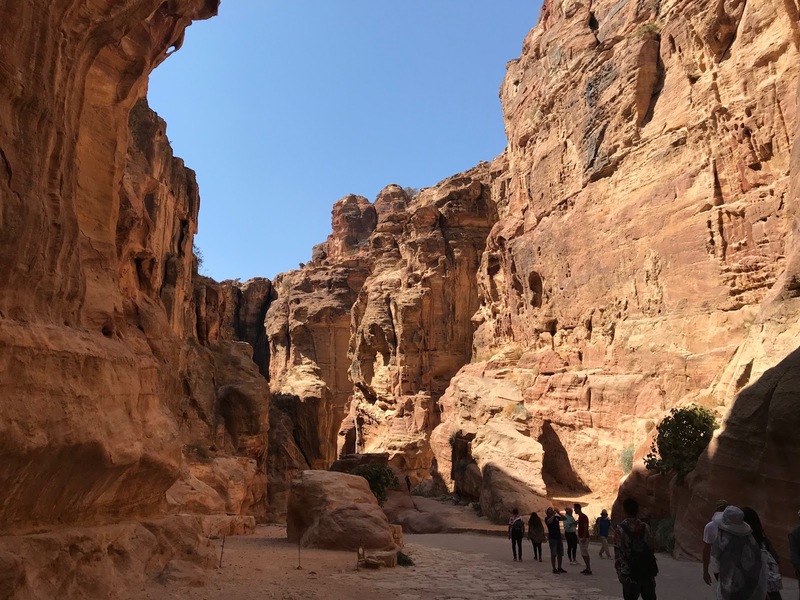 Luckily, although we had an early start, we were still able to check in at our hotel when we arrived and then relax just a little before heading off late morning to start exploring Petra. As I said above what can I say about Petra other than wow!! I'll also warn you now that all my posts about our visit are likely to be very photo heavy. It was pretty difficult to narrow it down, everything just lends itself so well to being photographed. Jordan is definitely a country where it's sensible to keep your passport handy at all times. On our journey as we entered the outskirts of the Petra area there was a checkpoint where we needed our passports and in order to buy your tickets to enter Petra you again need to show them. Petra is only accessible with a valid ticket which you can purchase from the visitor centre at the main entrance. From our hotel we were able to arrange for a taxi to take us there and to the other parts we visited, (more on that in upcoming blog posts) and take us back to our hotel again each day when we were ready. At the visitor centre you can get several ticket options to suit your plans with one day, two day and three day tickets available. We opted for a two day ticket option which I'm glad we did as there was no way we could have done all we wanted to in just the one day. At the entrance you'll also find a few souvenir shops, drinks stalls and toilets, don't worry though as there are plenty of souvenir stalls, drink stops and toilets (some more basic than others) once you get inside too. 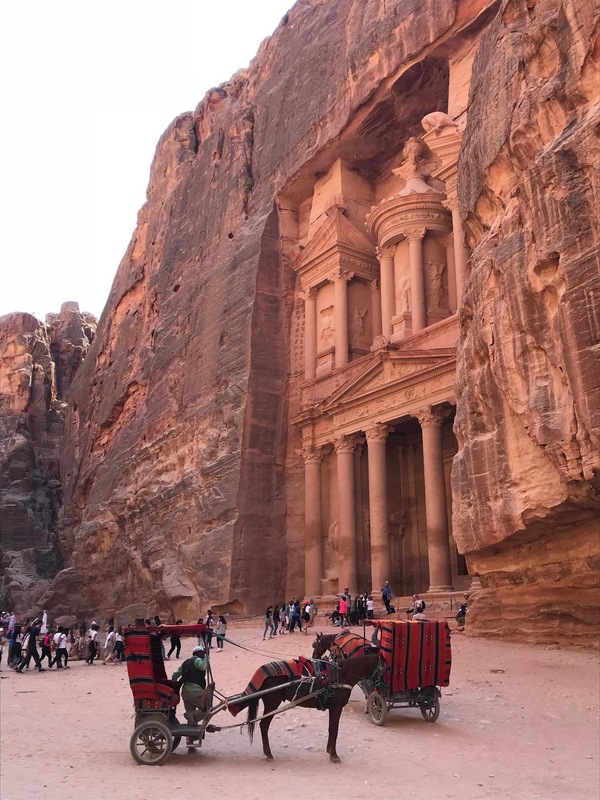 Here, if you want to, you can also book guides to take you to different parts and a little further in you can find donkey/horse rides or pony and carts to take you further into Petra. The tickets we bought actually entitled us to a horse ride from the entrance to the Siq as well as a guided tour of the main trail but we opted for neither. Whilst I used to ride many years ago I wasn't sure the uneven paths of Petra were the best place for me to rediscover my riding skills plus, as we saw on our second day going up to the monastery, it was quite steep in parts and no matter how sure-footed the pony may have been I wasn't convinced. Finally, if nothing else going by ourselves meant we could do so at our own speed, take breaks when we wanted to, explore what we wanted to and so on. From the visitor centre though, however you decide to do it, you are ready to discover the wonders and beauty of Petra. 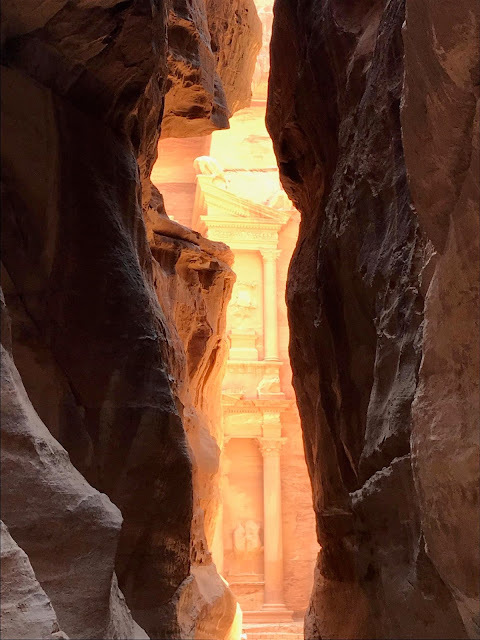 Petra has to be one of the most famous archaeological sites in the world and is one of those places where you'll find yourself instantly thinking of those early explorers discovering this wonderful lost city for the first time. 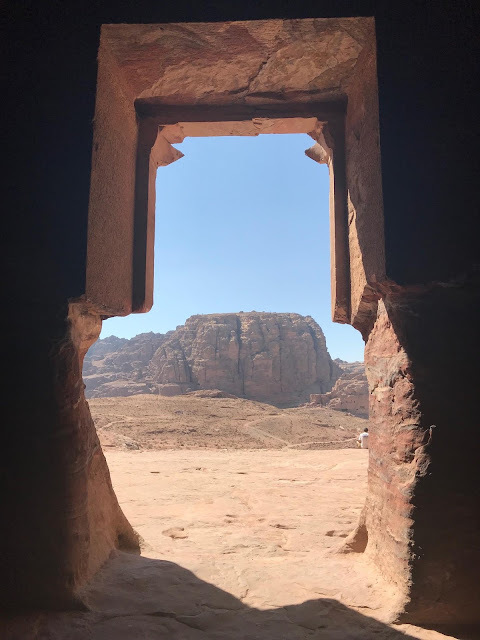 It was the home of the Nabataean Arabs, a nomadic tribe from western Arabia who were responsible for building most of the famous monuments we can see today. They were not the earliest inhabitants of the area though with evidence of Neolithic villages dating from around 7000 BC also having been found. 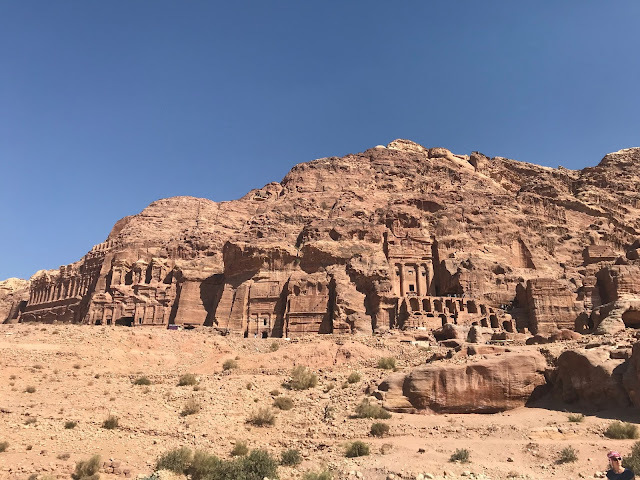 It's not known exactly when Petra was built but it began to prosper as the capital of the Nabataean empire from the 1st century BC growing rich through trade in frankincense, myrrh and spices, at its height it was home to around 30,000 people. 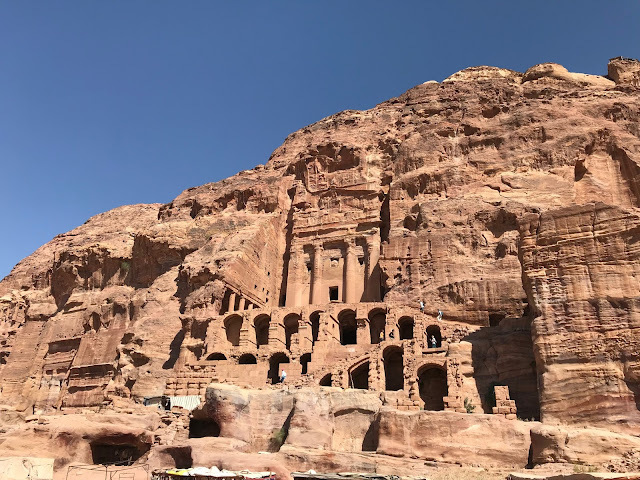 In time trade routes shifted and the Romans took control of the Nabataean empire but rather than abandon Petra they added familiar Roman features to it including a colonnaded street and baths. In the end a large earthquake destroyed much of the city and Petra became forgotten known only to the local Bedouin who preferred to keep its whereabouts a secret. 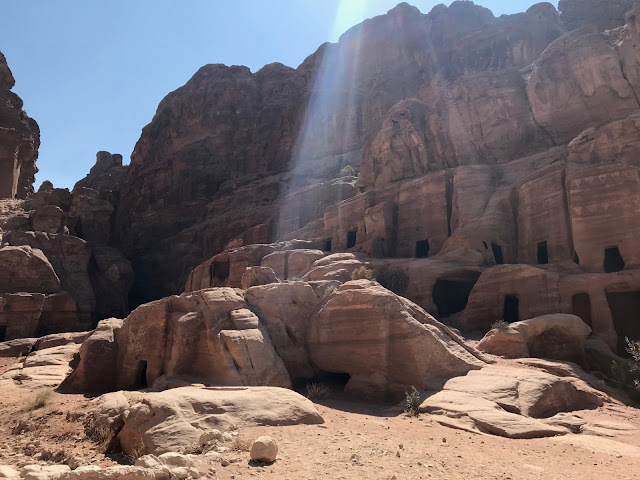 In 1812 though the Swiss explorer Jean Louis Burckhardt rediscovered Petra by dressing as a Arab and convincing his Bedouin guide to take him there. 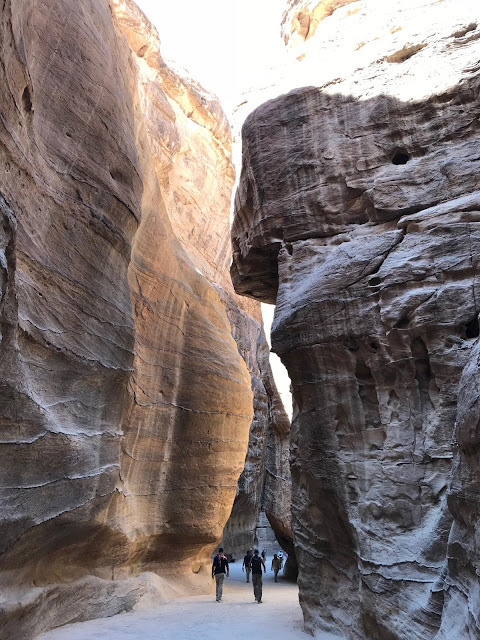 Following this rediscovery Petra became the focus of the Western European fascination with this part of the world, numerous archaeologists, travellers, poets and artists visited with the first British archaeological team arriving in 1929. Even now excavations continue and despite all this scrutiny over the years it seems Petra still hasn't finished giving up all of its secrets just yet. 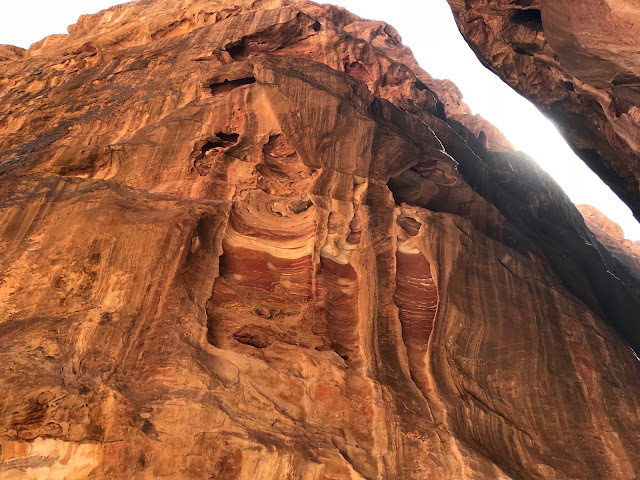 The geology of the sandstone rocks at Petra is amazing! On leaving the visitor centre entrance and after passing a couple of tombs we found ourselves walking towards the Siq, the ancient main entrance to the city. You can see it in the photos above but it's a narrow gorge, which occurred as a result of a natural splitting of the mountain. It's quite an amazing entrance which builds anticipation for what lies ahead and with the mountain towering above us being the first of many 'wow' moments we experienced. As you continue to walk through the walkway widens and narrows providing welcome shade from the sun above and, at the same time, tantalising glimpses of beautiful blue skies. On this part of the route you'll find the horse and carts (you can see a few of these in some of the photos) fly past you at quite an impressive speed given the narrowness of the path in places and the number of tourists. This felt a little like being taken right back to when it was a living breathing city, I can just imagine horses and carts flying up and down that entrance way carrying goods etc. Finally we were rewarded by that first peek of the Treasury (Al-Khazneh) as we walked through the gorge. If you've ever seen any TV programmes, photos etc. about Petra you'll be bound to recognise this part and it truly is as jaw-dropping as you may imagine it being. There is a very conveniently placed coffee stall to the one side of the open space you walk into when you get to this point and it's well worth stopping there, both for a cup of Arabic coffee and for the chance to just look and take it all in. 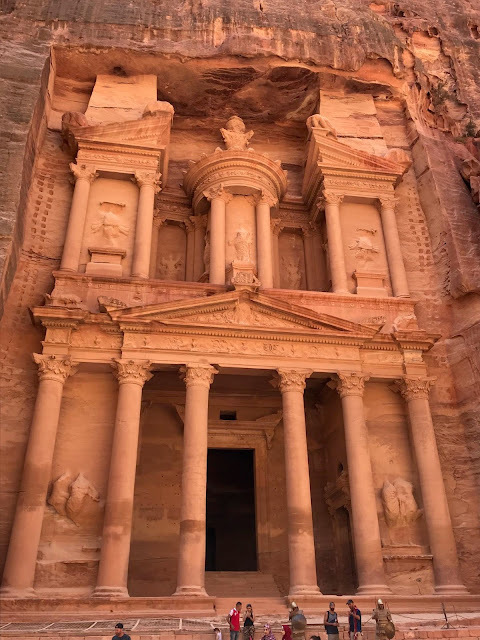 The Treasury, like all the monuments here, has been carved into the sandstone and was originally built to serve as a tomb for the Nabataean King Aretas III. 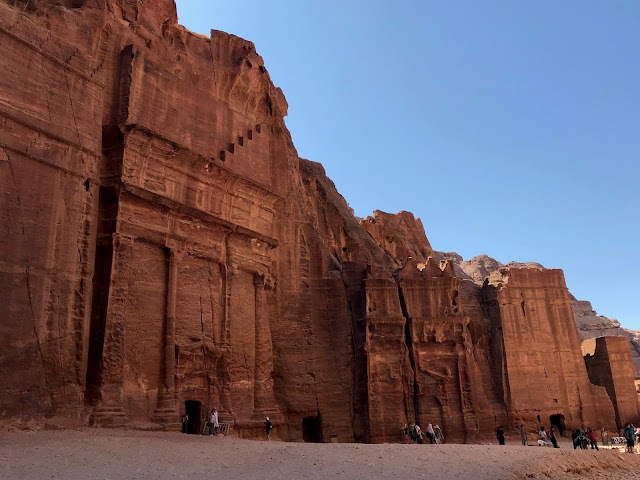 It gets its name from a story that an Egyptian Pharaoh hid his treasure here, more specifically in the façade urn at the top while pursuing the Israelites. As recently as 2003 another tomb complex was found beneath it, see what I mean about Petra still having many secrets to share! Even with what is possibly still to discover about the city you can't fail to realise that Petra is full of tombs (there were many more to come over the course of our visit) and for years early visitors assumed that it was a vast necropolis. The earliest tombs date from the 3rd century BC and the size and design of them depended on the social status and financial resources of the deceased. After a coffee break we were ready to move on from the Treasury and we then found ourselves walking into the Outer Siq and then along the Street of Facades, another collection of tombs. Here the path broadens considerably as you can probably tell from my photos below. This is also where I began to appreciate the suncream I'd put on. I'd recommend that suncream, a hat, water and light clothes that protect you from the sun be on your packing list before travelling, even if, like us, you travel there when it's cooler. With that in mind though I think that October is a good time to visit, with temperatures in the high twenties it was warm but not unbearable. We only really got a little hot walking on this part where we were right in the sun and then on the steep climb to the Monastery on our second day but that was more the climb itself than the heat. Be warned though that at this time of year it really does get a lot cooler at night so make sure you bring a cardigan/jumper or even a light jacket with you for the evenings. 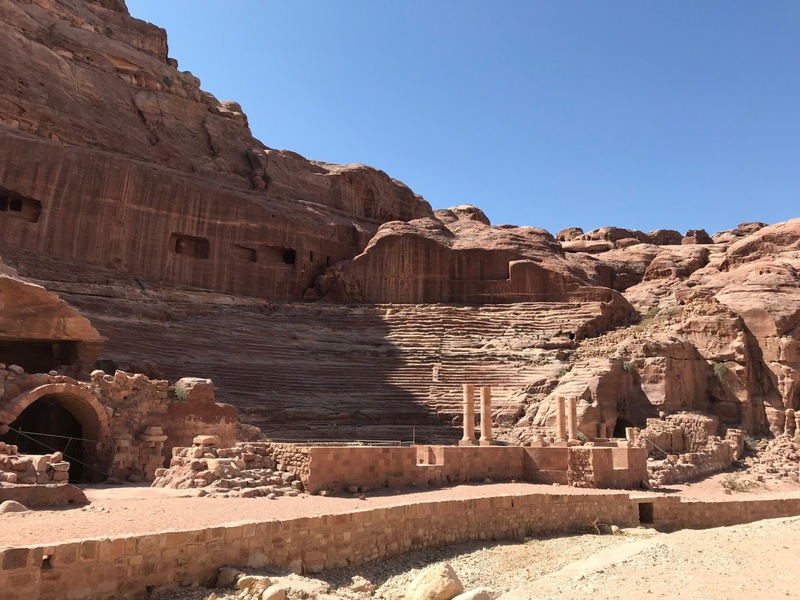 A little further along is the theatre which was originally built by the Nabataeans and not the Romans, although they did enlarge it, over 2000 years ago with an original seating capacity of about 3000. The theatre was also carved into the rock and is the only theatre in the world like this. Above the theatre are the remains of some earlier tombs partially removed in order to make more room for upper seating tiers. I've mentioned a lot of tombs so far (it's not hard to understand why early visitors assumed the city was a massive necropolis) and that they all ranged in size and design depending on the means of the person buried within them. Some of the most ornate façades though are of the Royal Tombs which are just a little further on from the theatre and are regarded as the high point of Nabataean funerary architecture. They are great to view from the ground but to see these at their best and also get some good views make sure you climb up to explore them in more depth, you may be able to make out some people doing just that in my photo. The very top one is known as the Urn Tomb taking its name from the jar that sits above it. This was likely built around 70 AD and was built for King Malichos II (AD 40-70) or Aretas IV (8 BC-AD 40). You can probably see there is quite a large terrace in front of it and according to a Greek inscription inside the tomb this was later used as a cathedral in AD 447. 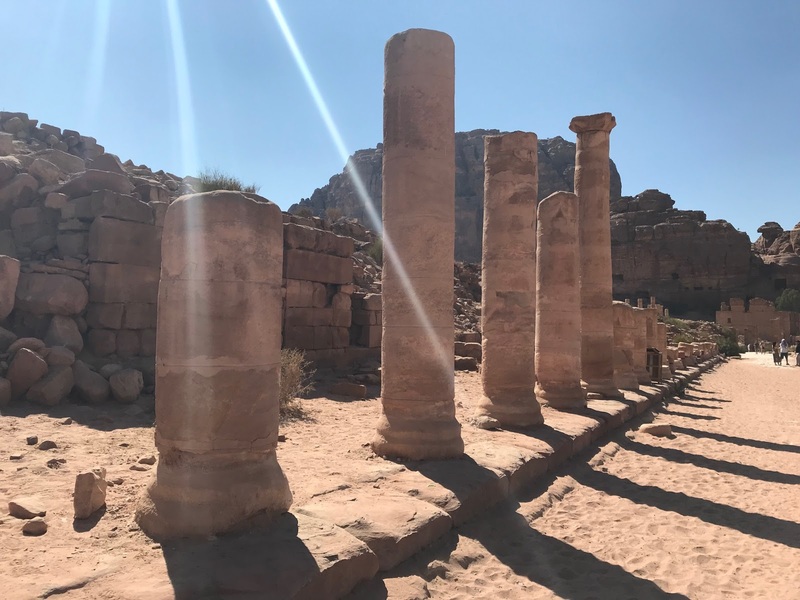 The final part we saw on our first day was the Colonnaded Street which marks Petra's city centre and would have been one of the principal shopping streets of the city. It was built around AD 106 by the Nabataeans but was refurbished during the Roman occupation. Along this street are the remains of several structures including the market area, Royal Palace, baths and the church. Just past the street and before making the climb or taking a donkey to the Monastery there is the Basin restaurant offering a buffet lunch option and hot and cold drinks. This made a good stop for us to get some refreshment and we decided then that we would save the climb to the monastery for our second day. 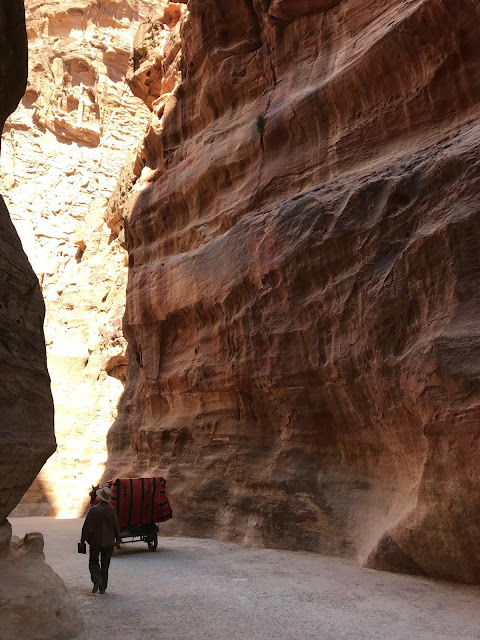 Our taxi driver had told us of a different entrance to Petra that would be a better starting point for our climb. So after a late lunch and a rest we walked back along the route we'd followed. Although we were seeing the same things we got to see everything from the opposite direction and this gave us some alternate great views. Plus it also meant we got to see the Treasury again with the later day's sun rays shining on the beautiful rose coloured stone. This was only day one of our visit! Route wise everywhere we went today was relatively flat and very easy to navigate. Once you get beyond the Siq there is more sand so sensible shoes will make things easier for you and as I said above a hat, suncream and water are all advisable. The only climbing we did today was when we went to the Royal Tombs but although the steps up are a little uneven they are still easy enough to manage. There is a slight incline on the final part of the walk back to the visitor centre and exit, which after a hard day of exploring was surprisingly tiring but the good news is that the hotel just by the entrance to the site has a very handy bar (the Cave Bar which occupies a 2000 year old Nabataean rock tomb) so you can always pop in there for a sit down and refreshing drink before heading back to your own hotel.